Renae McIntosh’s interest in pediatric nursing started in 2005. From her time as a CNA at Denver Children’s Hospital to her master’s program at DePaul University, she spent the early parts of her career from a practical point of view. Her career then took her to critical care focusing on patient care with much higher acuity. She has worked as an MS RN at Women’s and Children’s Hospital in the Pediatric ICU in Columbia, MO since 2008. Renae also has taught clinical and didactic portions of N3760 Pediatric Nursing and N4270 Nursing of Children since 2013. 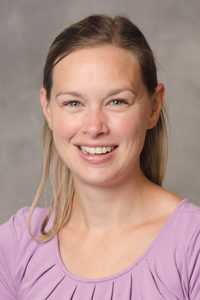 McIntosh has three children, Henry, Louella and Charlie, and is married to Tim McIntosh, who also works for the University of Missouri System. Originally from Montana, Renae loves spending time with her family, watching Packers football and traveling.